Dave Browne of Hornet Hobbies builds, paints and weathers the Lend Lease Matilda kit from Tamiya. 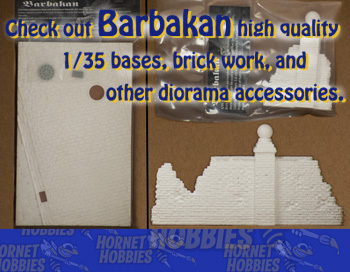 As always, many thanks go to Robert of Barbakan and IPMS Toronto, and his YouTube Channel for his hard work on these tutorial videos. Episode 1 - Dave looks at the differences in the sprues of the Red Army Matilda kit and suggests an alternate build and paint order. Episode 2 - Colour selection, spraying the base coat and the importance of thinner. Episode 3 - Painting and weathering order around the running gear and tracks. Applying pigment and static grass to create mud effects. Weathering the mud and skirts. Episode 4 - Creating scratches, highlighting rivets, using pencil crayons and applying washes.